I'm sure it was Lillian's best Christmas present ever. When she and Bill had been married some 23 years prior, they had eloped, and she had only a simple wedding band as a symbol of their commitment to each other. There had been no elaborate wedding, and her dirt-poor farmer could not give her a diamond ring, but I never heard her complain. She often said that she would never have chosen anyone else to spent her life with, regardless of how much money he had. As Christmas approached, they also prepared to celebrate their wedding anniversary on December 28. Bill had something different in mind this year. Typically, for Christmas, they gave each other the same simple gifts: she gave him a can of pipe tobacco, and he gave her a box of chocolate-covered cherries. But this year, he had something different in mind. Lillian's wedding band was wearing thin, so he took it to the jewelry store to have it "fixed", but instead had it incorporated into a new ring, complete with a diamond. He then took the traditional box of chocolates, hollowed out one of the candies and placed the ring inside. Their four teenaged children, who were in on the surprise, carefully picked around the "special" chocolate as she passed her gift around to them. She knew something was going on, and eventually discovered her special present. At the age of 46, Lillian finally had her diamond wedding ring. Alfhilde Olsen Monsen, widow of Gabriel Monsen, with her baby daughter Gabriella (later known as "Ella"), this photo was taken about 1885 in Bergen, Norway. Her husband, a sailor, died at sea in a boating accident, leaving her with three small children. Ella Monsen Christensen immigrated to the United States from Norway at the age of 20, learned English, and worked as a houshold servant. She later sent for her mother and siblings. 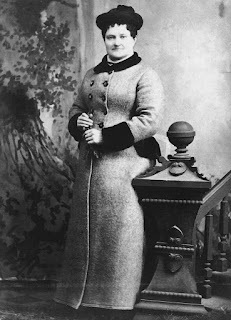 She married Peter Christensen, a baker, in Huron, South Dakota. She is pictured here with her daughter, Lillian, about 1912. Lillian and her first child, daughter Betty, on their farm in Beadle county, South Dakota, about 1939. 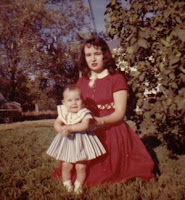 Betty, with her first daughter, Karen (me! 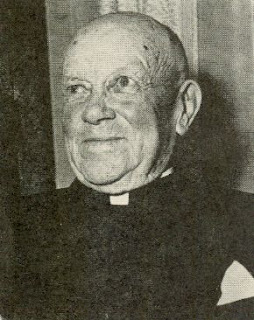 ), about 1959. I'd really like to thank Carol, from Reflections From the Fence for this nomination, and for her encouragement with this blogging stuff. If you're interested in RVs, family history, or just like a Good Read, check it out. 1) I've got an incredible God who sustains me minute by minute, and crams each day full of blessings I don't deserve. It's been a Wild Ride, and I can't wait to see what's next! 2) I've got the most wonderfullest husband in the world. Oh heck, just throw in the whole family - they are the best. Add the dogs in there too. Never a dull moment! 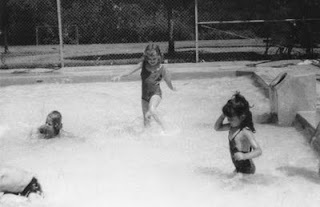 3) I love doing family history - mine, or anyone else's, for that matter. I enjoy doing lookups and research for people, each time remembering how great it felt when I was first starting out and some very kind and generous people helped me get going, and still how good it feels to discover something new or meet a new cousin. 4) I'm addicted to making websites, of course, pertaining primarily to genealogy and history. I am a volunteer for GenealogyTrails, and host the state site for South Dakota, as well as Beadle and Hand Counties, and Olmsted county, Minnesota. And I'm the webmaster for the Peoria County (Illinois) Genealogical Society. Can't get enough. 5) I really need to get off this computer and do something active more often. 6) I love cheesecake, which necessitates that I get off this computer and do something active more often. 7) I love to quilt, crochet, and bake good things! 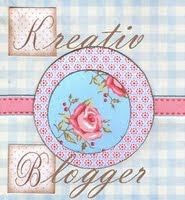 I hope you check out some of these blogs, if you haven't already. Any mother sending her son off to war has to do so with such mixed feelings - pride, tempered with fear; faith, battered by the reality of death. So often I have tried to imagine what my great great grandmother, Nettie Graves, must have felt as she watched her only son, Delbert, leave for Camp Dodge, Iowa, on a warm Thursday in June of 1918. 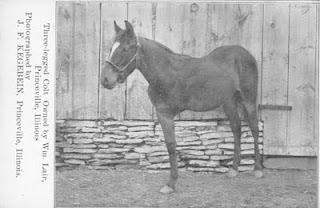 Delbert, being the only boy in the family, had spent a lot of time with his father, helping him with the farm work, and together, they constructed numerous buildings on the flat plains of eastern South Dakota. Delbert worked for a dray business, and raised hounds, and often helped his brother-in-law, Will Knutz, on his farm. Delbert's absence from his family was no doubt immediately felt. His father, Tom, mostly did carpentry work after Delbert left, probably finding the farm to be a burden to handle alone. Delbert's younger sister Lulu, often pictured with him, must have had a difficult time adjusting to his absence. 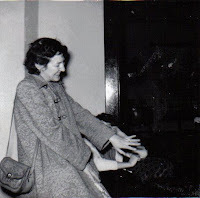 And then there was his mother, Nettie. I know how I would have felt, and not sure there are words to adequately express it. 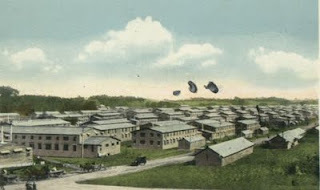 Delbert's first stop was Camp Dodge, Iowa, pictured at left. He often sent his little sister postcards, one, sent in August, just prior to him being relocated overseas, read, "Hello, Lulu, Have had a couple of easy Days work lately. Good Bye, Best Wishes, D.D.G." Delbert was a member of Company H of the 351st Infantry, commonly called the "Doughboys." 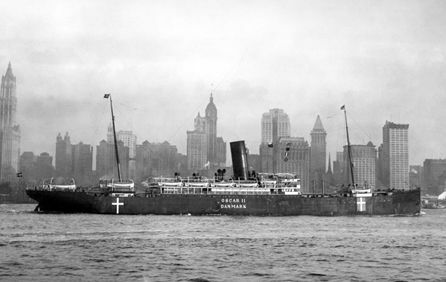 From Camp Dodge, he was sent to Fort Des Moines, and then to England at the end of August, and shortly afterward, to France. Influenza was rampant, and struck the military in France especially hard. After being in France a mere two weeks, nearly the whole Company came down the the flu. Makeshift hospitals, such as those pictured here, were quickly constructed to deal with the incredible numbers of sick soldiers. 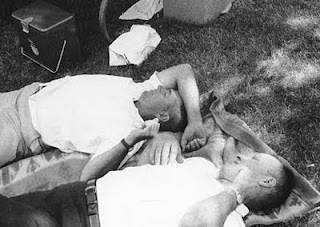 Delbert's friend, J. W. Hofer, who had gone through Camp Dodge with Delbert and was assigned to the same Company, told of being sick himself, but not so severely as Delbert; he made sure Delbert was covered up, and brought him food, as often as he was able. Still incredibly weak from his illness, Delbert was not able to go with his Company when they moved on. On December 5, his condition worsened, and he was admitted to Base Hospital No. 18, with a diagnosis of Scarlet Fever. Delbert died December 12, 1918. His family was notified shortly thereafter. His body was laid to rest in the American Cemetery at Bazoilles-sur-Meuse, Vosges, France. However, reports kept surfacing from some of the other men who had known him, that they had seen him after this time, leaving the family with an incredible amount of anxiety, but hope as well. More military investigations took place, and his death was definitely confirmed in April of 1919, some four agonizing months later. I cannot imagine how many sleepless nights his family endured during this time, not knowing the fate of their son for so long. 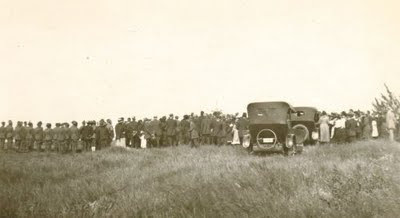 They began making arrangements to have his body returned home, and laid to rest in their little town of Carthage, South Dakota, in Pleasant View cemetery, just outside of town. In June of 1920, Delbert finally came home. A brief service was held at the family home - not exactly the homecoming they must have dreamed about for their beloved son and brother. A public funeral was held at the cemetery, with The Delbert Graves Post of the American Legion in charge of the services, with full military honors. A tremendous number of area people came to pay their respects and comfort the family, as can be seen from the photo above. His will be done forever." God bless you, Delbert, and thank you for your sacrifice. This photo depicts the Will Knutz family of rural Huron, South Dakota, enjoying their new car. 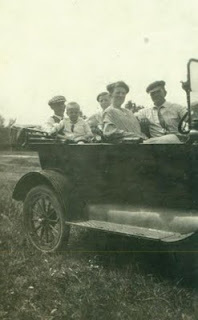 The photo was taken prior to 1918, and includes Will Knutz behind the driver's wheel; his wife Elvirta beside him, and in the back is little Howard, their son, Delbert Graves (Elvirta's brother) and Lulu Graves (Elvirta's sister). Will and Elvirta's sons William and Richard are not in the photo. It was said that it took Will awhile to refrain from pulling the steering wheel and saying "Whoa" to get the car stopped! Are you having a Ruhamah Day??? It is with great relief that I report that I'm not a blood descendant of Ruhamah Jones Nickerson. I am, however, a direct-line descendant of her father-in-law, William Nickerson. But he's a topic for another Black Sheep Sunday. Ruhamah was born about 1650, and married Joseph Nickerson, and they lived in Massachusetts. 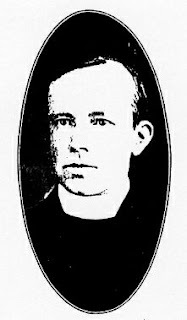 The Nickerson family is well known there; Joseph's father William (mentioned above) having founded the town of Chatham. But Ruhamah was well-known in her own right. While described as being a beautiful woman, she was also known as being, according to the Nickerson Family Association, "of a disagreeable nature," to put it mildly. She *lived* for harassing people. She was not burdened with the constraints of manners or polite social behavior. Both the Indians and her white neighbors alike were afraid of her, and went out of their way to avoid making her angry. If anyone provoked her, she would "play havoc with their washing, their choice plants, and the fruits of their harvest." Any time, day or night, Ruhamah was Ready To Rumble, and never backed down from a confrontation. Oddly enough, Edward Bangs, an early colonist and a direct-line ancestor of mine, once argued with her, and his barn burned down a short time later. Ruhamah outlived her husband, and another family took her in, while the townspeople were ordered to pay them for her support. No matter what the compensation, I'm sure it wasn't enough! She lived to a ripe old age, and had spent so many years sitting that when she died, it was "thought best to bury her in the same crooked position". And they did. Perhaps their way of getting the last laugh? Sometimes we all have a Ruhamah Day, and would love uproot the tomato plants of the $#*()!! who just cut us off in traffic. It's okay to savor the thought. You aren't grumpy, you're just Getting In Touch With Your Inner Ruhamah. Think about it all you like, just don't do it, or people might be remembering you, too, some 400+ years later! You had to be tough in the "Dirty Thirties," whether you were a farmer, a farm animal, or a plant trying to put down roots in the blowing sand. 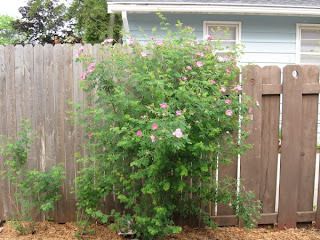 "Rose trees" grew wild in the South Dakota ditches, so, armed with a shovel, my grandmother dug up a few of them and re-planted them in her yard. Years went by, times got better, more flowers were added, but the rose trees thrived and multiplied. Rebecca Lair - The Rest of the Story? ?